“How fast should I lose weight?” This question is hard to answer because it’s different for everyone. There are variables that changes your rate of weight loss. Your height, weight, body mass, and basal metabolic rate all play a part in how fast you will lose weight. Also keep in mind that your body will change faster if there is a dramatic difference. For example, if you go from eating all junk food to eating lean protein and slow processing carbs, you will definitely lose weight faster then someone who just made some minor changes. (See our tweaks below to move the scale in your favor). In general, we will see women lose an average of 1-2 pounds per week. Men tend to lose more. The average weight loss for men is 3-4 pounds per week. Again, this is all dependent on how many changes you are making to your daily routine. If you are losing faster then these averages then your doing well!! If you aren’t then use or helpful weight loss tweaks below. Change it Up – Change your routine. We don’t mean minor changes we mean flip the whole thing. If you have been using the treadmill then it’s time to hit the stairs. If you hate doing weight training then it’s time you picked up some dumbbells. If you love dairy but you over eat it, then ditch it. You get the point. Pin point some huge changes and make them work for you. Drink Your Water – If you want to look lean and lose then you have to take in enough water to flush the toxins, sodium and excess water weight. If you aren’t drinking it then you are definitely storing it!! Shake it Up – Are you used to your late night snacking ritual?? Start drinking a protein shake BEFORE the cravings start. If you wait till after they hit, then you are at the mercery of your stomach. Use a low carb protein shake to ward off the extra pounds. BURN IT UP – Shoot for burning 500 calories per workout. Try to get into the gym 4-5 times a week. 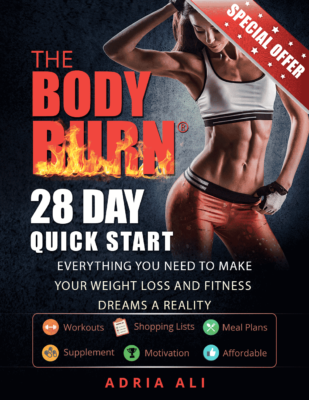 If you aren’t sure how much you are burning then it’s time to pick up a bodybugg. Fiber – Feel full all the time by choosing foods that keep you satisfied. Here is a list of fiber rich foods. Go To Bed Hungry – We know this goes against everything we have been taught as kids. However, going to bed a little hungry ensures that you are under your calorie count. Read a book, take some melatonin and doze off. Don’t forget that for every 3,500 calories you “save” you lose one pound. So stay positive and give your body time to save up this deficit in order to shed the weight. If someone else is asking “how fast should I lose weight?” Direct them to this article and website so they can be part of or Fit Tip Crew.